Joey, 19, is from Brooklyn and is an art student at Pratt. 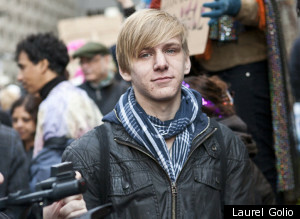 He spoke to the We Are the Youth project about his new hobby: “I’ve been going down to Zuccotti Park at least once a week. My friends and I go there and yell so loud and so much that I’ve been losing my voice a lot. I’m trying to get other people active and not feel apathetic toward it. I’ve been beating myself up a little bit for not going more, but midterms happen…” Don’t beat yourself up, Joey! That’s the job of the riot police. More from Joey here. This entry was posted in Activism, New York, Photography, Youth and tagged Activism, Culture, Gay, Gay Youth, New York, Occupy, OWS, Photography, Revolution, Zuccotti Park. Bookmark the permalink.